Postal service available for all services. 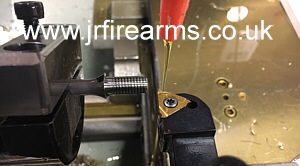 Why not set your Sako 75 apart from the rest with one of our custom tactical bolt knob conversions. Our bolt knobs are amongst the strongest and most stylish looking upgrades available on the market. 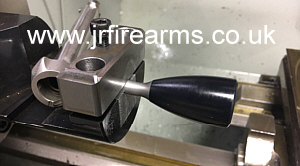 Using our special bolt jig we turn down your existing bolt handle and then cut a 5/16 x 24 thread using single point tooling, to which our extended bolt knob upgrade just screws on to. 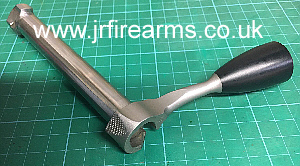 As you can see from the pictures below we pay great attention to detail, making sure that the new knob blends in perfectly with the profile of the original bolt handle. Our upgrade really will make your rifle stand out from the rest. A few pictures showing the conversion, upgrade process. Sako 75 Tactical Bolt Knob upgrade. Jig now dialed in ready to be turned down. The finished Sako 75 bolt conversion. custom bolt handle, sako 75 bolthandle extension, Tikka, CZ, Ruger. 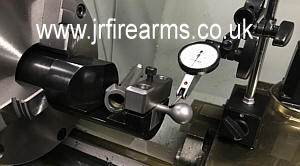 Bedfordshire, Buckinghamshire, Hertfordshire, Northamptonshire, Milton Keynes, London, Dunstable, Luton, Houghton Regis, Amphtill, malden, toddington, aylesbury, buckingham, leighton buzzard, Gunsmith services, gunsmithing. Beds, Bucks, Herts, Northants, London, north london, south london, east london, west london. Oxfordshire, Oxford. Postal service available on all bolt conversions.